Prevent damage to valuable entryways at your work site with Pro Tect Jamb Protectors. These pre-formed snap-on sections are rigid and durable, offering heavy-duty protection for both wood and steel door jambs or window sills. The pressure fit design of these protectors allows for use on a variety of widths, guarding against gouges, nicks, and scratches during construction. 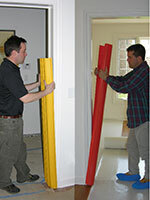 There are no adhesives or fasteners required because each section wraps around the jamb to hold tight. For temporary protection against gouges, nicks, and scratches during construction, use these sturdy cardboard counterparts. Prevent damage to vulnerable door jambs and trim on the work site.